Where to go for a good bowl of soup . 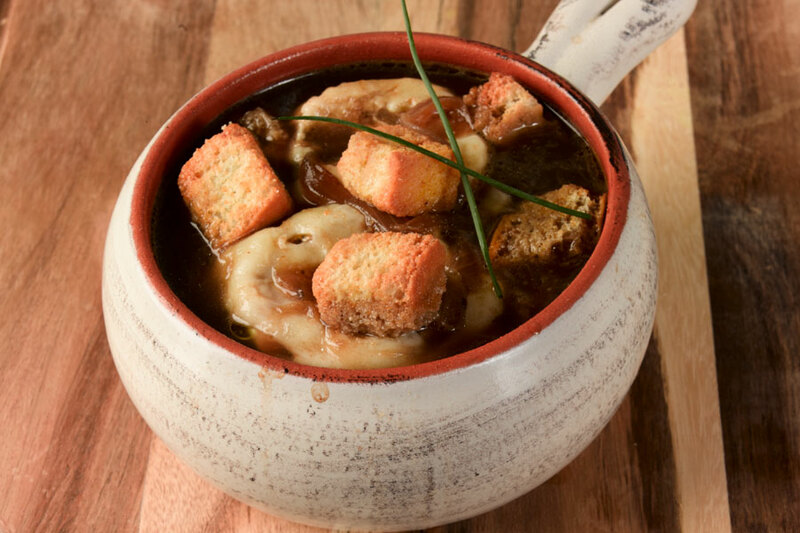 . .
A great sit-down restaurant serving American comfort food with a modern twist, Barley Mac has a great bowl of French onion soup. View menu. Choose from Ben's Famous Chili with ground beef, peppers and onions or their vegetarian chili with textured vegetable protein, tomatoes, green peppers and onions. View menu. Enjoy matzo ball soup and chicken noodle soup. View menu. Although CAVA's focus is on bowls they do have an heirloom tomato soup that they serve in the colder months. View menu. Enjoy fine dining at cityhouse, located at Hyatt Centric Arlington. Their lunchtime winter soups include cream of crab and vegetarian heirloom tomato. View menu. Cosi has a good selection of soups from which to choose. Their offerings include French onion, tomato basil, chicken noodle, turkey chili and Mediterranean lentil. View menu. Serving craft beer brewed in Baltimore, Md., Heavy Seas Alehouse has some great (and complementary!) onion and ale soup. View menu. This family owned and operated Japanese restaurant serves some great soups, including miso soup, shumai and gyoza. View menu. Like Cosi, Panera offers good variety, including ten-vegetable soup, turkey chili, low-fat chicken noodle, baked potato, broccoli cheddar, vegetarian creamy tomato, cream of chicken and wild rice, French onion and New England clam chowder. View menu. Although their menu focuses on pita sandwiches, The Perfect Pita does serve navy bean soup as part of their vegan menu. View menu. This place is more or less a soup paradise. All they serve is pho: Vietnamese noodle soup. You get to choose various proteins and then they add noodles, bean sprouts, cilantro, basil and lime. It's delicious. Plus, the space is totally no-frills, which only adds to its charm. The Washington Post named their steak soup one of their top soups to get you through the winter. View menu. Potbelly's selection of soups includes chicken pot pie, beef chili, broccoli cheddar, chicken enchilada, garden vegetable, loaded baked potato and classic tomato. View menu. Newly arrived in Rosslyn, Saigon Noodles & Grill serves a great variety of Vietnamese pho (beef noodle soup), as well as rice noodle and egg noodle soups. View menu.